Honda continues to provide top-quality vehicles to its consumers in Merrillville, IN, thanks to their illustrious 2016 line-up. The 2016 Honda CR-V is no exception and continues to be a top choice for discerning motorists. While the 2016 model carries over many of the exciting tweaks and upgrades from 2015, a new Special Edition trim level has also been added to provide even more variety to customers. As always, Honda has made strides to outdo itself in quality, while keeping prices competitive and easy on customers’ wallets. New for 2016 is the Special Edition model, a new level of trim that provides an upgrade from the entry-level LX, while coming in just under the luxurious EX. The SE trim adds a high-quality and tested security system as well as rear privacy glass. Beyond the added security and comfort, the SE trim also replaces the LX’s standard 16-inch steel wheels with stylish 17-inch alloys for that extra touch of flair on the road. These small but noticeable changes help personalize the 2016 Honda CR-V choices available to consumers, so everyone can get the level of style and comfort that they choose for the price that they deserve. Merrillville customers who want an added touch of elegance and extra safety features can upgrade further to the EX model, which adds several assistance features, such as Honda’s Lane Watch system and automatic headlights, as well as stylish body-color mirrors and door handles. The EX can also be upgraded to the EX-L, which adds leather seats, an upgraded audio system, auto-dimming mirrors and more. For the full package, there’s also the CR-V Touring model, which comes equipped with the full range of driver-assistance systems, adaptive cruise control and 18-inch wheels. Of course, numerous safety features are available on the 2016 CR-V. Aside from the previously mentioned Lane Watch system, available features also include dynamic guidelines in the rearview camera, forward collision warning, lane keeping assistance and automatic braking. A navigation system with turn-by-turn directions can be added, as well. The 2016 Honda Cr-V provides everything the Merrillville, IN driver could desire: safety, comfort, performance and smart pricing. 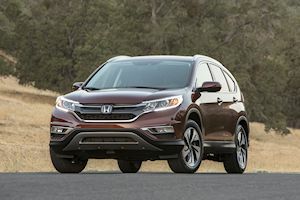 Wrapped up in a slick exterior, the newest compact crossover model from Honda continue to wow consumers and critics alike thanks to its sharp design, quality performance and many personalization options.